HRW also said that much of the produce cultivated and harvested by child labor is exported to Europe and the US. "Israel’s settlements are profiting from rights abuses against Palestinian children. Children from communities impoverished by Israel’s discrimination and settlement policies are dropping out of school and taking on dangerous work because they feel they have no alternatives, while Israel turns a blind eye," HRW's Middle East director, Sarah Leah Whitson, said in a statement. "They've made up lies. The entire goal of this organization is to sully Israel's image. If they'd show me a farmer employing a child, I'd report it to police immediately," David Elhayani, a former farmer, told AFP. He insisted he would lose his exporting license if he were caught employing child labor, although he did acknowledge that the Palestinian contractors he works with use middlemen who could employ children without a farmer knowing about it. HRW interviewed 38 children and 12 adults to research their report in the Palestinian communities of the Jordan Valley who were employed by settlement farms in the area. 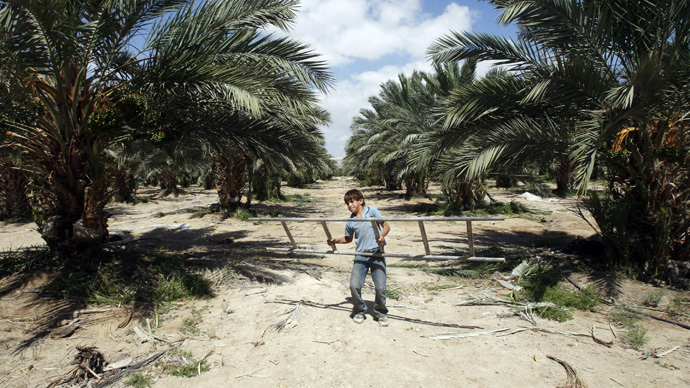 HRW acknowledges that children are the minority of workers employed on settlement farms, but says that they do so because of a lack of any real alternatives. Israel’s policies throughout the occupied West Bank restrict Palestinian access to land, water and fertilizer as well as their ability to transport and sell their goods. “Ask [the children] if they have any bread in the house,” a Palestinian middleman who supplied Palestinian workers to settlement farms told an Israeli human rights worker. The researchers found that most of the children working on settlements had dropped out of school and the rest were working part time while still attending school. “It’s very obvious which kids go to work in the settlements, because they are exhausted in class,” a school administrator told HRW. On average, children said they began working at the settlements when they were 13 or 14, but HRW found one boy who said he started working when he was 10. Work starts at 5:30 a.m. or 6 a.m. and lasts for seven to eight hours, which increases to 12 hours during harvest time, often for six or seven days a week. “The work that children perform can be both grueling and hazardous,” the report says. Some children complained of skin rashes, dizziness and vomiting after spraying crops with pesticides without adequate protection while others were injured by sharp blades and machinery used to cut crops. Temperatures can exceed 50 degrees Celsius in summer and so many of the children as well as the adults are susceptible to heat stroke. The children working in settlements are paid very low wages, far less than the Israeli minimum wage, which is $6.20 an hour. Most of the children interviewed by HRW earned $16 to $19 a day. Israeli and Palestinian law makes it illegal to work if you’re under 15. Under military orders issued by Israel in the West Bank, Israel’s domestic minimum wage law is applicable to Palestinian workers in settlements. But the practice of using middlemen to hire workers means there’s mostly no contract linking an employee child or otherwise to their employer. Workers are paid “in cash, [get] no pay slips, and there are no [work] permits, so there is no paper trail to demand severance pay or anything else,” a Palestinian middleman told HRW. Children working in Israeli settlements not only violate Israeli and Palestinian law but also international law. Both Israel and Palestine are party to the Convention of the Rights of the Child, which protects children from being economically exploited and from performing work which is hazardous or interferes with their schooling. HRW also called on the US and Europe to stop importing produce from the settlements, much of which is given preferential tariffs. "The EU has moved to exclude Israeli settlement products from the preferential tariff treatment it provides to Israeli goods... but [member states] have not instructed businesses to end trade with settlement-based entities. The US in practice continues to grant preferential treatment to Israeli settlement products under the US-Israel Free Trade Agreement," HRW said.